Wireless charging has been integrated into a whole lot of things ever since it has become popular. You can find it in public locations, inside cars, and even under tables. 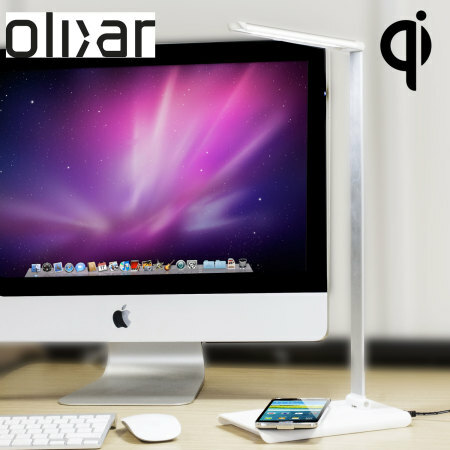 Olixar has placed wireless charging into one of the most intuitive places you can put it in, a desk lamp called LumiQiLUX and its portable brother LumiQi. The wireless charging pads are inside the stands of the desk lamps making it completely unnoticeable. You will only know about it if you were told, looking at it alone, you will never notice what these desk lamps are capable of. 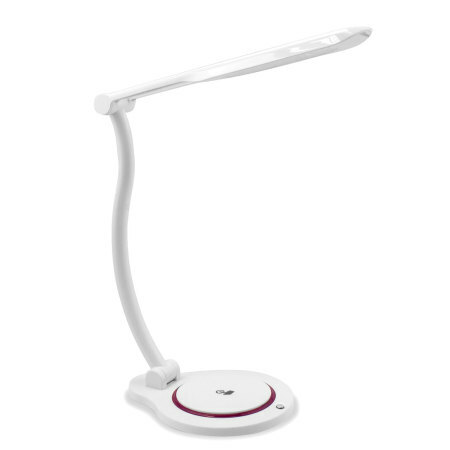 The LumiQi is the smaller and lighter desk lamp made for portability. 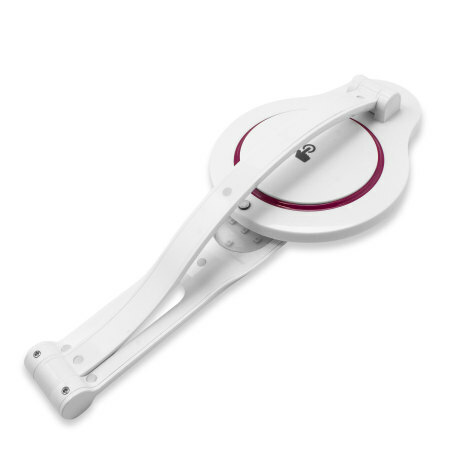 It is available in white with a purple ring at the bottom surrounding the touchpad, and is made out of ABS plastic and acrylic for a lighter weight. 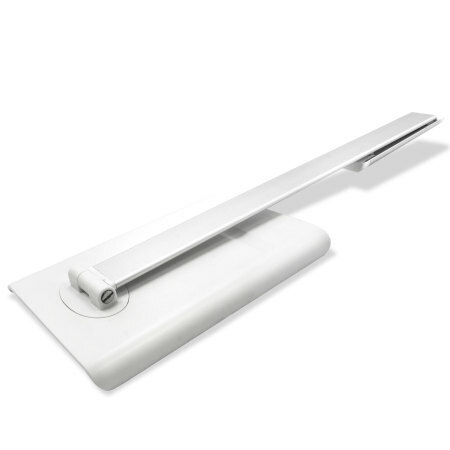 It has a two-hinge design for you to be able to adjust its angle and also fold it up for you to easily bring around. There is also a small silver pad at the bottom center of the stand, we’ll explain what that is later. The touchpad on the stand is used as a dimmer for the light to have the appropriate brightness you want. 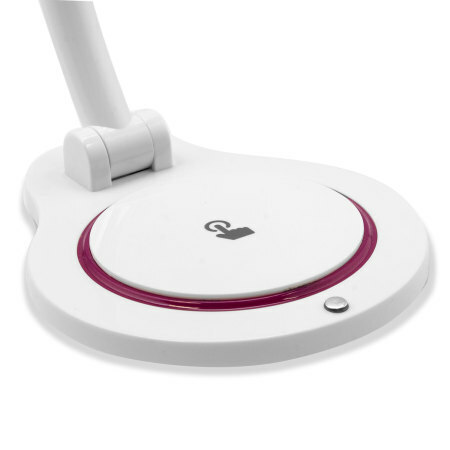 It also doubles as a Qi wireless charging pad that can charge any Qi-enabled device you place on it. The small silver pad on it is the on and off switch for the light, this also has a touch sensor on it meaning you only have to tap it to turn the light on and off. The only physical switch on Olixar’s LumiQi is on the bottom which is an on and off switch as well for the charging pad. I am unsure though if this is the master switch that turns both the light and the wireless charging off. The LumiQi takes in 10W of power from your socket, enough for the LED light, Qi wireless charger, and to charge its own battery. Hopefully we’ll be able to get a review unit to see how it all really works. This is a portable lamp, and for it to be so, it should work without a wire stuck to its bottom. The LumiQi will come with a 850mAh battery inside the lamp. This will be enough to power the lamp, but not much with charging devices on-the-go as it is far too small to charge smartphones. If you need to charge a smartwatch, maybe it could, take note though that the 850mAh battery is shared between the wireless charger and the lamp, and so we can say that it is a portable lamp, but not a portable wireless charger. 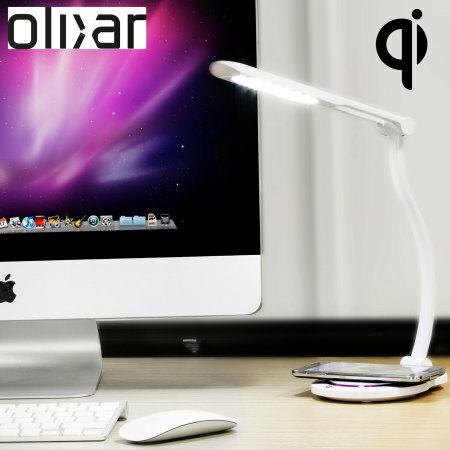 Olixar’s LumiQiLUX, the bigger, non-portable brother of the LumiQi has just about the same features as its brother with just a few adjustments. The LumiQiLUX follows the two-hinge design letting it be adjusted and fold it up for storage. It is also made out of ABS plastic, but rather than using acrylic, aluminum alloy is substituted to give a strong sturdy build without sacrificing too much of its weight. It is also available only in white with LED indicators at the bottom. Besides the sleek looks Olixar’s LumiQiLUX has, there are just a few things that differentiates it from the LumiQi. This desk lamp is not made to be portable and does not come with a battery inside. It is made to stay on your office or work desk though, not needing a battery to move it around. It uses up 24W of power compared to 10W of the LumiQi, it uses more power because it can also be brighter than the other desk lamp. This desk lamp also forgone physical switches in exchange for touch sensitive switches. The front part of the lamp’s base has the touch sensor which triggers the lamp to go on and off. Right on top of that are six presets where you can choose the intensity of the light. 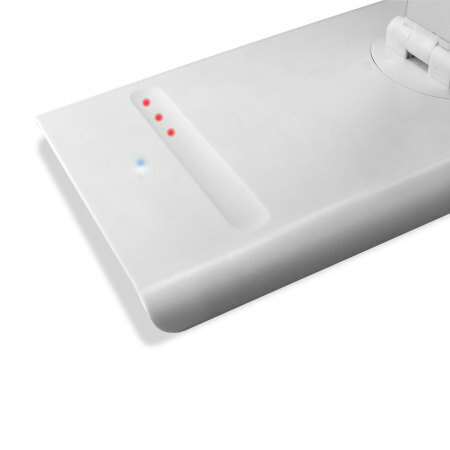 Most of the surface of its base is left for wireless charging for Qi-enabled devices. Olixar’s LumiQi and LumiQiLUX will be available for $67.99 and $100.99 at MobileFun. It currently is only available for pre-order at the moment, but once the stocks arrive, we are hoping to have a more in-depth review of their desk lamps.